The seventh season of Star Trek: Deep Space Nine is a remarkable accomplishment. The seventh season is not perfect by any measure. Taken as a whole, it lacks the consistency that made the fifth season one of the best twenty-odd-episode seasons of television ever produced, particularly in a dire mid-season run of episodes that includes Prodigal Daughter, Field of Fire and The Emperor’s New Cloak. The fifth season (and even the sixth) never hit a run of three consecutive episodes that drag that hard. Similarly, there are moments when the production trips over itself during its epic run of ten closing episodes. Similarly, it lacks the sheer quantity of all-time great episodes that made the sixth season so exciting and compelling, like that opening six-episode arc or Far Beyond the Stars or In the Pale Moonlight. However, the seventh season does quite well for itself; episodes like Treachery, Faith and the Great River, Once More Unto the Breach, The Siege of AR-558, It’s Only a Paper Moon, Chimera, Inter Arma Enim Silent Leges and Tacking Into the Wind are massively underrated and count among the best episode that the franchise ever produced. However, the seventh season has a very clear sense of direction and purpose. After all seven years is a long time on television. By the time that the other Star Trek series hit that mark, there was a sense of exhaustion creeping in around the edges. The final season of Star Trek: The Next Generation often felt aimless and meandering, the production team waiting to transition to feature films. The final season of Star Trek: Voyager felt similarly worn out, a faded photocopy of an approach that had worked on the previous three seasons. 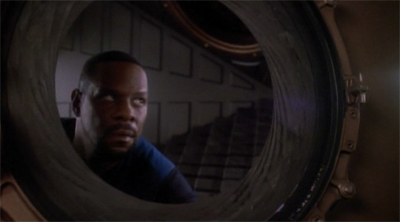 In sharp contrast, the seventh season of Deep Space Nine knows roughly where it is going. From the opening scenes of Image in the Sand, the production team are cognisant of the fact that the curtain will be coming down at the end of the season. As a result, the seventh season is written with an ending in mind. The writers might not have known that ending from the outset, and were still working on it even during the sprawling final arc at the end of the year, but they knew that it existed and was waiting twenty-six episodes in the future. As a result, the seventh season of Deep Space Nine has a very strong sense of identity and compelling sense of urgency. 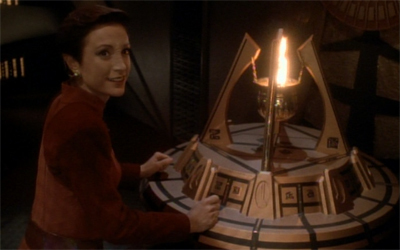 These attributes distinguish the season the final years of The Next Generation and Voyager, but also mark it out as one of Deep Space Nine‘s (and the franchise’s) strongest years. In its third and fourth seasons, Star Trek: Deep Space Nine is undergoing something of a transformation; a metamorphosis. This is only natural. Shows evolve and grow as they go on. The production team discovers what works and what doesn’t, allowing them to play the strengths of the premise and the ensemble. It happens to most shows, if they live long enough. It happened to Star Trek: The Next Generation when Michael Piller came on board in its third season. It will happen to Star Trek: Voyager when Michael Piller departs in its third season. Change and transformation is inevitable, for television shows as much as for people. The third and fourth seasons of Deep Space Nine saw a change taking place. Ira Steven Behr had taken more and more control of the show since the late second season, starting with The Maquis, Part II. Michael Piller had stepped back from the show in its third season, completely ceding control with Life Support. The show was changing in a material sense. The Dominion came to the fore, Bajor faded to the background; Worf joined the cast, Odo found his people, the Klingons were an on-going concern again. By this point in the fourth season, the transformation is almost complete. Deep Space Nine is very close to its final form, standing on the edge of its biggest departures from the established Star Trek canon. 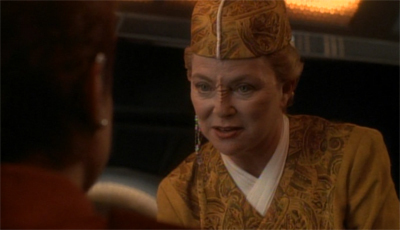 Part of those changes involves a reconfiguring of what Bajor means to the series. Accession begins the process of drawing down the curtain on the Bajor arc as it began with Emissary all those years ago, allowing Sisko to find some peace in his position and a sense of closure in his appointment before the show’s emphasis on Bajor changes dramatically. There are really two versions of Shakaar. As such, it makes sense to offer Kira an opportunity to get back to her roots – to suggest that Kira might secretly want to return to the relative simplicity of a rebel fighter resisting an oppressive government; fighting a war is a lot less complex than navigating the peace. Kira’s reunion with the Shakaar Resistance Cell is meant to offer her a way to escape into something comfortable, to avoid moving forward; because moving forward is tough and painful. Shakaar should be about Kira learning that she has to push forward. It should be a companion piece to Progress. The episode can’t quite manage this. Instead, we end up with an episode about how Kira gets swept off her feet by a dashing hunk of a man – an episode that leaves the viewer with the unfortunate implication that Kira only needed to find another weirdly paternal man to help her get past the death of the man she loved. Shakaar is an episode with a host of interesting ideas, but isn’t quite sure how to best bring those ideas to the screen. Explorers is a wonderful piece of Star Trek: Deep Space Nine, an episode produced by a show entirely comfortable with itself. Indeed, the entire point of Explorers seems to be stressing just how comfortable Deep Space Nine has become in its own skin. It’s a leisurely and relaxed celebration of what makes the show unique in the Star Trek franchise, wallowing in the things that make Deep Space Nine the show that it is. With a smart script by René Echevarria adapted from a solid premise by Hilary J. Bader, Explorers is an episode that never feels like it has anything to prove. And that’s the charm of it all.